I like to blend in when I travel. For some reason, I feel self conscious about being a tourist. I see Americans walking around foreign countries wearing baseball hats and sneakers, carrying guide books and cameras, shouting at the locals loudly and slowly in English, and it makes me cringe. I make a concerted effort not to be like that. I try to blend as much as I can. There are two things, however, that give me away. The first is my pasty white Irish skin. I can manage to blend in Northern Europe, but at the lower lattitudes it becomes quite clear that I am not a local. The other dead give away is running. I love to run when I am traveling. The running shoes always go in the carry on, never the checked bag (and every runner reading this just nodded in agreement). My runs are mental postcards of the places I have been. I have dozens upon dozens of them stored in my head. Running the coast of California, hitting the steamy roads of Florida, suffering through the heat in Arizona. I don’t recall the distances or paces, but I remember the places. Sometimes my runs are the clearest memories of my trips. I can’t recall much of what we did on a trip to Carmel, CA, several years ago but I remember my run along the ocean, passing the windswept twisted tree trunks, admiring the small but pristine homes, then turning left and starting to climb the hill. More recently, I had one of the most enjoyable runs of my life through Crissy Field in San Francisco. It was suggested by my pal John F. and it did not disappoint: a stunningly scenic loop out to Golden Gate Bridge. It was a highlight of the trip. One of my favorite memories is from running in Palm Springs. I felt fine going out, but quickly I realized my pace was dropping rapidly. My legs felt like lead and I was huffing and puffing like a heart attack victim. I started to worry there was something medically wrong with me. In fact, I even imagined the headline in our weekly paper back home: “Local Woman Collapses and Dies While on Vacation.” It would be tragic. There would be pictures of my young, motherless children in the paper. I started to think about the funeral details. Would someone know to choose lilies, my favorite flower, to drape on the casket? Deep in thought, I finally made it to my half-way mileage mark and turned to retrace my steps back to the hotel. As I did, I realized that I had run up a very long and large hill. It turned out I was not about to die. I just had suffered a little elevation gain. Most of my runs, of course, do not involve mentally picking out flowers for my own funeral. They are memorable, but far more relaxing. Except running in foreign countries, that is. I always feel self-conscious, sticking out like a sore thumb: the crazy American tourist. And I have never felt quite so out of place as I did in Luang Prabang, Laos. Laos is a Buddhist country, and each village has monasteries, or wats, with monks in residence. The villagers support the monks by providing them with food. In Luang Prabang, there are dozens of wats, and every morning the monks emerge to walk through the town collecting alms from the villagers who are gathered on the side of the road. 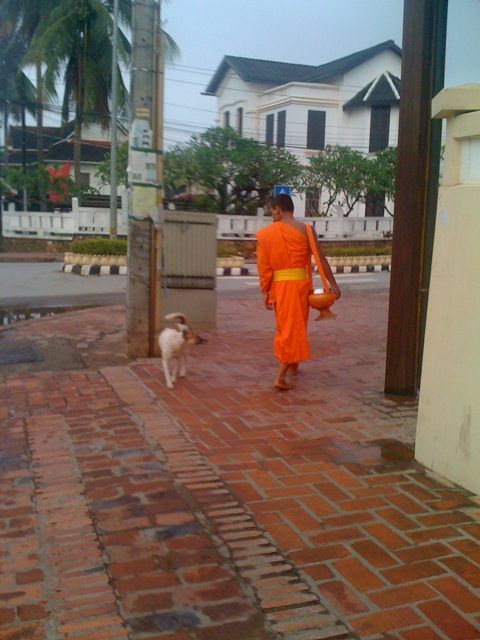 It is a stunning sight, hundreds of monks in bright orange robes walking solemnly through town, with the villagers on the side of the road, placing clumps of rice into the monks’ baskets as they pass. Our group had participated in the alms-giving on one of our days in Luang Prabang. When I decided to go for a run the following morning, I knew better than to run through the procession, so I waited until it was wrapping up. However, I also thought I might catch the end it, so I wanted to be dressed appropriately, and that meant modestly. The guideline in Laos is to have shoulders and knees covered when visiting a wat or during alms-giving. I decided to it would be prudent to follow protocol and dress accordingly in spite of the tropical temperatures. So there I was, in sweltering heat, decked out for cool autumn weather: running capris and a short sleeved shirt. I started sweating with the first step. I couldn’t help but think of my friend Chanthana, who was born in Laos, but is well-known for running in shorts even in sub-zero temperatures. She would be dying. Fortunately, there was a slight breeze to keep me from suffering too much. 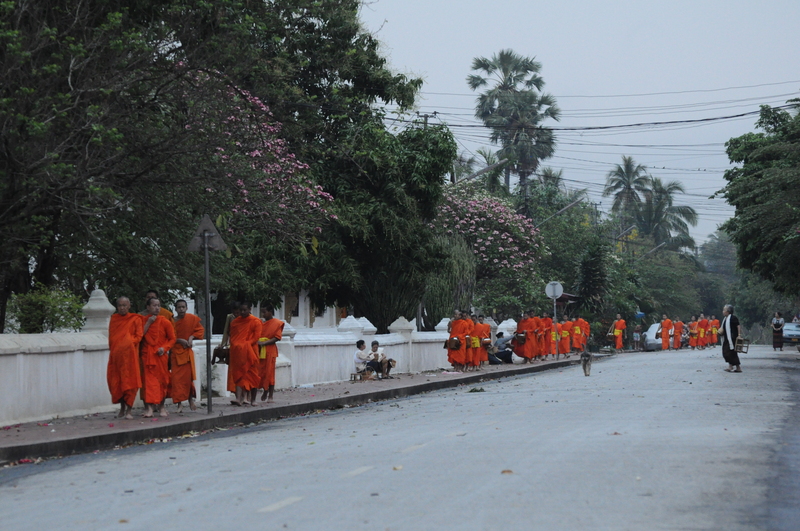 I ran through the village just as the monks were returning to their wats, then I headed toward the Mekong river. I felt as if I was sneaking up on people in the midst of their morning routine. Fisherman were out sorting and repairing their nets along the river bank. It seemed every shop and restaurant had someone sweeping the street in front. I passed women returning from the market, large woven baskets filled to the brim dangling from the bamboo poles spanning their shoulders. I saw children walking to school in their crisp white shirts. Dogs and chickens darted in the street. More than once I was nearly hit by water being thrown from buckets to clear the sidewalk. I passed pots beginning to boil on their makeshift open flame stoves. While no one overtly stared, I did get several double takes. I saw one other runner, a tourist like myself, and we exchanged big smiles. I saw a local man doing what appeared to be hill repeats, but while walking. In flip-flops. Traffic was light, so other than the occasional close call with a motorbike, it was a peaceful run. It was mostly quiet, with snippets of conversations I couldn’t understand floating around me. I drifted through my 10k as if in a dream and then wandered back into the hotel. I was greeted at the gate by a man with a big smile, bowing slightly, hands pressed together and fingers pointed skyward. “Sabai-dee.” Hello. Then someone came over and presented me with an iced scented towel. It was perfect. I have decided every run should end that way. I plan to institute a training program for my family as soon as I get back. Start practicing your bows, kids. And chill those towels. Sabai-dee. Sabai-dee 🙂 I haven’t heard that in forever… Clearly, you are a well-traveled woman, Sue and am extremely considerate person. I should dig up my old pictures of my sister and me in traditional Lao attire. Or better yet, I’ll share my parents’ wedding photo with you. I think you would love it. That is a run you may never forget. And thanks for the mention. Yes, I would melt!! Enjoy the rest of your trip. We miss you in Chicago. I may read snipets of your blog on the bike today when I sub your class, then at the end I’ll give everyone an iced towel. TTYL. Sounds like heaven! Well, except for the running part. Thanks for sharing the journey. Miss you! Sounds like a great day! I was so glad to see your postings I was wondering how you were doing. I also took to the streets for the first time this morning however, my run ended at Starbucks with an ice mocha but hey, I got out there! Stay safe! !